While a full, feminine silhouette is commonly considered an asset, breasts that are too large or disproportionate can be a concern. Women with excessive breast tissue can suffer with neck and back pain, as well as dissatisfaction in their appearance. 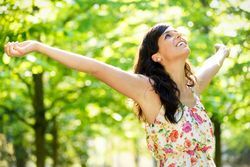 If you are interested in reducing your breast size, Dr. Stephen Metzinger can perform a breast reduction procedure at his Metairie, LA, practice. This treatment can provide a more proportionate physique, an improved body image, and an enhanced quality of life. To learn more about how a breast reduction procedure can benefit you, contact our practice and schedule a consultation with Dr. Metzinger today. A breast reduction procedure is often recommended for patients with physical pain and diminished self-confidence due to the large size of their breasts. For example, you may experience poor posture, neck, shoulder, or back pain, or even limited physical or social activities due to the size of your breasts. One breast might be noticeably larger than the other and your clothes might not fit well at the bust line. Around the areola: Sometimes called the doughnut technique, this approach is typically employed for patients who require the removal of a minimal amount of breast tissue. Keyhole incision: This incision pattern encircles the areola, and extends vertically downward to the base of the breast. Anchor-shaped incision: Like the keyhole technique, an achor-shaped incision encompasses the areola and extends down to the breast crease. This approach differs in that a horizontal incision is also made where the breast meets the rib cage, resembling an anchor. After the incisions have been made, Dr. Metzinger will precisely excise fat and skin. In some cases, liposuction will also be performed. Once your treatment goals have been reached, the incisions will be closed with sutures. As a cosmetic surgeon with a strong eye for detail, Dr. Metzinger can create the most natural-looking results. If the size of your breasts is causing you physical pain or emotional distress, it may be time to consider a breast reduction. The best way to find out if breast reduction surgery can improve your quality of life is to schedule a private consultation with a reputable cosmetic surgeon like Dr. Metzinger. Reach out to us today to make an appointment.